Just three shutouts in the first 57 championship games, followed by three in the past ten years, is testimony to how the once high-scoring college game has changed. 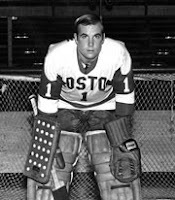 As former BU coach Jack Parker has pointed out, "they should call the game 'goalie'." 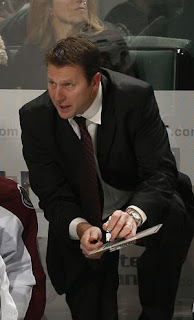 Former Terrier standout Joe Sacco(photo), now head coach of the Colorado Avalanche, has been selected to lead Team USA in this Spring’s IIHF Men’s World Championships in Helsinki and Stockholm. Before beginning a long NHL career, Sacco scored 128 points in three seasons wearing Scarlet including 52 points (28 g, 24 a) as a senior in 1989-90. Tomorrow, we’ll post the latest Terrier Tale, the story of the 1989-90 Terriers’ run to the Final Four, authored by blog contributor mh82. Kevin Shattenkirk’s heavy hit on Chicago’s Andrew Shaw, in the Blue’s 2-0 loss to the Blackhawks, made numerous highlight reels. Charlie Coyle also dished out a heavy hit in the Minnesota’s 3-2 shootout loss to Columbus. The apparently legal hit to Artem Anisimov precipitated a fight between Coyle and Brandon Dubinsky. Coyle received two five-minute majors and a match penalty, but the match penalty was rescinded as the league determined he hadn’t targeted the head. Alex Chiasson impressive NHL start took a detour last night when the rookie right wing suffered an upper-body injury—possibly a shoulder sprain—in the Stars’ 5-2 loss to Chicago Monday night. Two days earlier, Chiasson picked up his sixth goal in his first six games—becoming the first NHLer to do so since Evgeny Malkin in 2006-07. The first period goal proved to be the game-winner in the Stars’ 2-1 win against San Jose. Chiasson’s six goals have come on 13 shots.